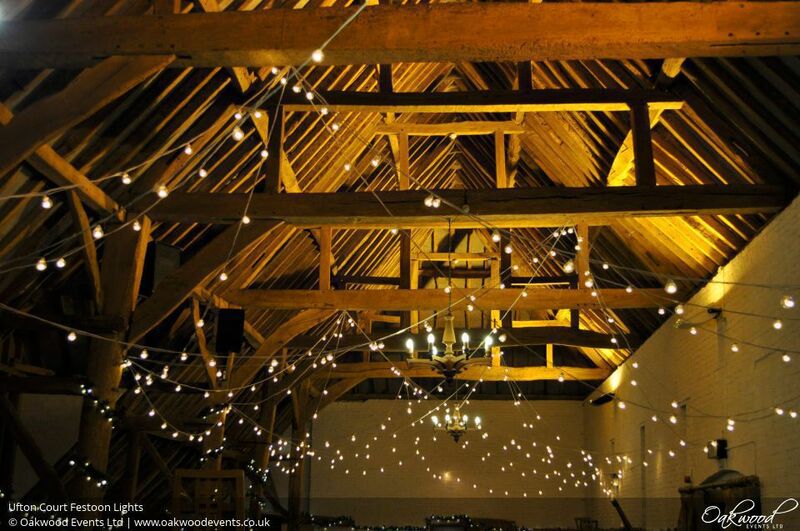 This is rapidly becoming one of our favourite lighting designs to install in the large barn at Ufton Court - hundreds of metres of beautiful festoon lights hanging from the beams in random loops. The randomly looping lights hang from high points on the barn's main beams and lower points around the walls, forming stunning peaks and swags along the full length of the barn. We use the highest quality, dimmable LED festoons with bright, transparent bulbs which are warm white in colour. We love how the canopy looks during the day and then becomes a sparkly, starry sky over the dance floor at night! More wedding lighting ideas can be found on our Ufton Court lighting page. 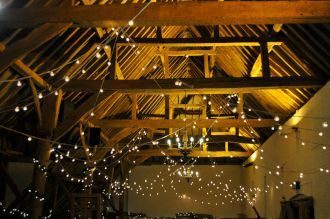 Just wanted to send you an email to say how happy we were with the festoon lights you installed or us on Saturday - it looked so magical in the barn, everyone commented on how beautiful it was!